ART && CODE is an event series and online community dedicated to the democratization of computer programming for artists, young people, and the rest of us. MOBILE ART && CODE is a symposium on the artistic and tactical potential of mobile, networked and locative media, which took place November 6-8, 2009 at Carnegie Mellon University in Pittsburgh. In November 2009, we continued our successful workshop/lecture series with MOBILE ART && CODE: Mobile Media and Interactive Arts – a symposium on the aesthetic and tactical potentials of mobile, networked and locative media. 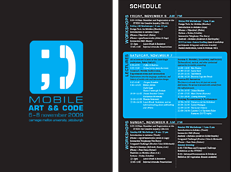 The three-day event featured intimate, practical, arts-oriented programming workshops for popular mobile platforms (such as the iPhone, Android, Nokia Smartphones, Arduino, SMS, and Asterisk PBX systems) along with an all-day series of free lecture presentations that contextualized the use of these technologies in a variety of contemporary critical, artistic and design practices. MOBILE ART && CODE was made possible by a generous grant from Microsoft Research, with oversight by the Center for Computational Thinking at CMU. The ART && CODE symposium series is a project of the CMU STUDIO for Creative Inquiry, directed by Golan Levin.